How to reduce your PCI scope. A business’s ultimate goal with PCI compliance (besides being compliant of course) should be successfully reducing their PCI scope. Being ‘in scope’ indicates any system component included in or connected to the card data environment (comprised of people, process, and technology) that stores, processes, or transmits cardholder data. To have a system or environment ‘out of scope’ involves more than just the lack of credit card data storage or processing on a system. To be classified as out of scope, a system can’t even be connected to other systems that process or handle card data. Reducing PCI scope ultimately boils down to reducing the areas in which payment card data touches. Not only does it reduce the time and resources required to become PCI compliant, but it also provides significantly more security. Ultimately, the less number of critical systems that store, maintain, and handle cardholder data, the less work you have to do to secure them. Whether through recent and rapidly evolving technologies or age-old methods, reducing scope has recently become more and more attractive to businesses. PCI scope reduction is often advocated when the changes to an environment are expensive, or will negatively impact the business. In these cases, it’s reasonable to consider moving PCI systems to their own environment and limiting their interaction with non-cardholder data handling environments. Remember that PCI DSS compliance and validation is not a quick or easy process, but reducing scope is one of the best ways to lighten the PCI load and reduce risk of payment data theft. 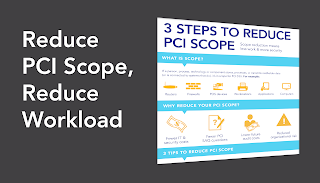 So how does PCI scope reduction work? There are many different ways to reduce your PCI scope, and most depend on how your network and environments are already structured. 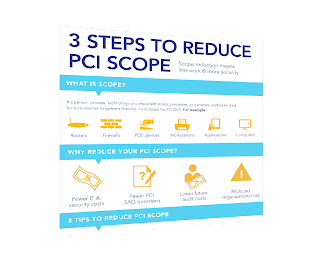 The following infographic outlines 3 of the best ways to reduce your PCI scope. Tweet this scope reduction infographic.